So, what did I get in the week of Sunday, January 3rd to Saturday, January 9th? 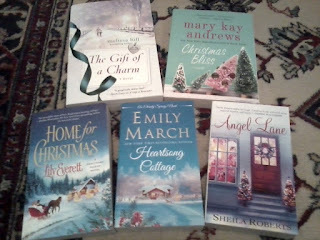 SMP Romance prize pack - thank you, St. Martin's Press! I started this book on Friday night and OMG it was so good! AHHH! The last one I needed! Thank you so much, Lori! I'm kind of ridiculously excited because my Throne of Glass buttons set is COMPLETE! Thank you to the ladies that helped me get these! First week of winter classes wasn't bad! How was everyone else's first week back to work/school/non-holiday life? Glad the first week back went well. Monday was tough, but the week got easier. Ooo, I hope you enjoy Dare to Run as much as I did, Sophia. :D Monday was so painful! But I agree, once a few days passed, I was back in the swing of things! Nice haul 😁 love your buttons. Great haul this week! I'm DYING to read Dare to Run!!! I hope you get the chance to read it, Danielle! Those buttons are so adorable and I love them! YAY for finally getting them all! 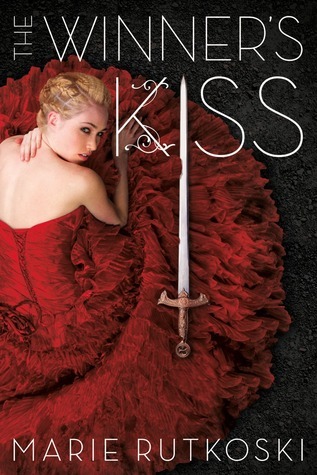 And you know I'm a wee bit jealous of your copy of The WInner's Kiss! Just let me know if it's as awesome as I hope!! I do too! I'm so grateful that those specific ladies helped me get all seven. Gah! So happy. It's a bittersweet thing, getting this eARC! I wish more could have gotten it. I know Macmillan usually doesn't do ARCs/eARCs of final books - I have a feeling they only did this because of the big deal with the covers. In any case, I have no doubt that it will be lovely! I certainly will let you know! 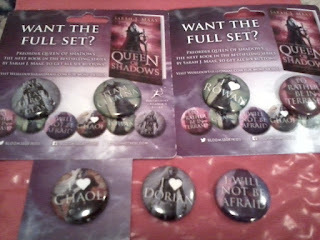 Ooh I want to start that Rhiannon Thomas series:-) And congrats on your buttons! I love buttons too, nice that you have the whole set. Have a great weekend! OOh nice! I still need to read A Wicked Thing, though I still requested this one! Can never seem to stop requesting books even if I am behind in the series! LOL! 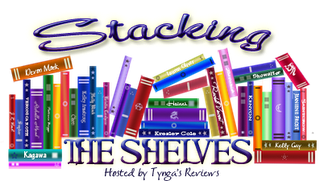 hope you enjoy all these awesome reads! And yay for completing your button collection! Those ToG Buttons!! I was supposed to get some from Bloomsbury but they never arrived *sniff* I should get in touch with them and see what's up. 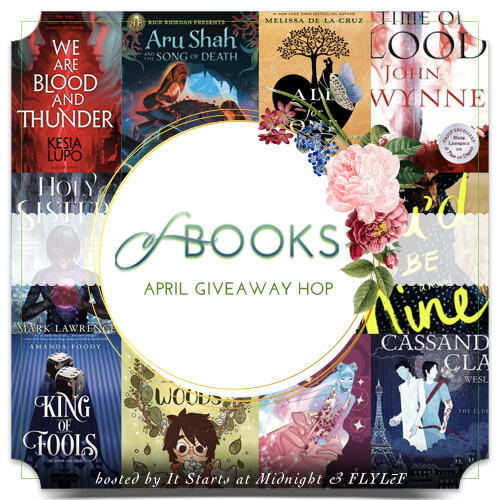 Anyway, I LOVE THEM <3 You got some awesome books as well, A Wicked Thing, Kingdom of Ashes and Winner's Kiss all sound amazing - I still need to read Winner's Curse myself >.< Happy reading~!! Nooooo, I'm so sorry! You totally should! And I highly recommend you binge-read The Winner's Trilogy, Micheline. :D Thank you! 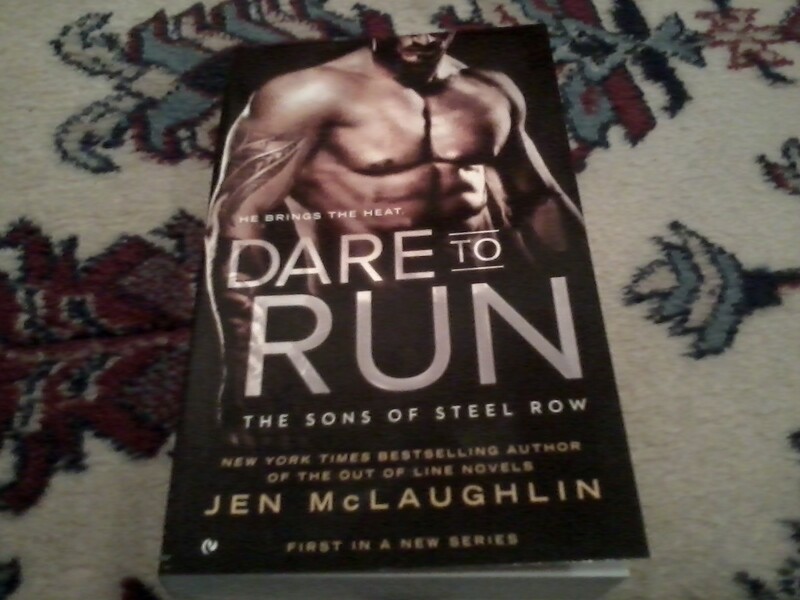 I have Dare to Run on my TBR, and I love your buttons, you had a very nice week!! It's a good one! And thank you, Joann! I'm a huge button collector, so having all seven of these is AMAZING! I'm pretty happy. And thank you, Carina! Ahhh that's so exciting that your buttons are all complete! 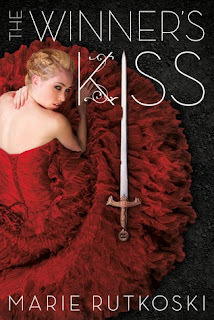 OMG I am dying for The Winner's Kiss, I hope you enjoy it! After that cliffhanger for The Winner's Crime, it's definitely something that I want to pick up ASAP! Enjoy your reads, Alyssa! It's been agony, waiting for The Winner's Kiss! I can't start it immediately, unfortunately, but SOON! The Winner's Kiss!! Oh. My. Goodness. I cannot even contain my excitement for you (and also, my jealousy for me hahahha). 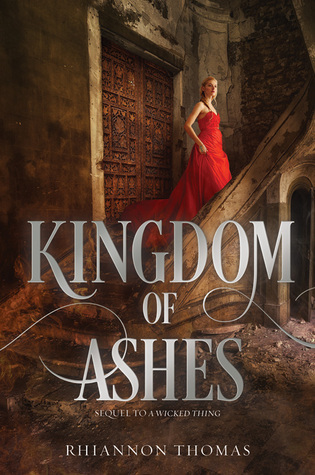 And Kingdom of Ashes is one I am looking forward to. I am in purgatory for it currently ;) I agree, Banished was FABULOUS, not that I expected anything less! And YAY that you got all your buttons! That is wonderful!! So glad that you were able to find them all :D Hope you have a fabulous week and enjoy all the books! It was quite a surprise, since they said they wouldn't have ARCs/eARCs for the final book! But hey, I'll take it. I'm glad you loved Banished! The wait to book three will be TORTURE! It was indeed an invite! The blog tour participants got the invite, which was super sweet of the publisher. I am jelly of TWK! I have seen it so much in my feed this week. I wish I had it! Probably my most anticipated book of 2016! Great haul, too! I have Walk the Edge and Kingdom of Ashes. I'm looking forward to reading them! Have a great week, Alyssa and thanks for stopping by The Cover Contessa! I think it's my most anticipated trilogy conclusion! I'm terribly nervous but very excited. That's an amazing haul, Alyssa! 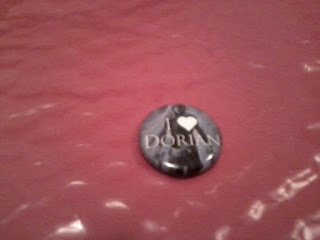 And the buttons are so cute :) I hope you'll enjoy all your new books. Great haul! Love the buttons, dont have any myself, but congrats on the whole collection. I just did STS as well this week, first one, over on my blog. Kingfom of Ashes sounds interesting I will have to check it out! 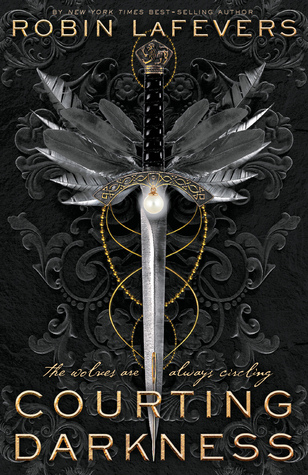 I hope you read A Wicked Thing/Kingdom of Ashes! 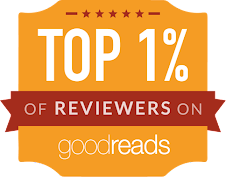 Kingdom of Ashes sounds good, I hope you enjoy your reading and have a great upcoming week. I think so too! Thanks, Brandi! So many romances that I haven't heard about! I guess I will wait for you to tell me all about them! I still haven't started Katie's now series, I must do it soon!!! I'm not sure how many of SMP ones I'll read (since it was a giveaway prize, nothing with obligation), but I hope to try a few. 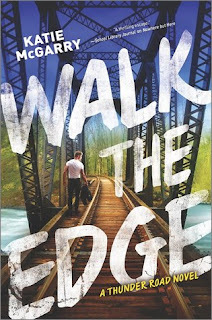 I personally didn't *love* Nowhere But Here, but I am excited about Walk the Edge! Can't wait to get to Kingdom of Ashes! Great haul this week! I've still got to get started on the Winner's Curse! You MUST binge-read the Winner's trilogy, Lisa! Oooh, I can't wait for your thoughts on The Winner's Kiss! Neeeed it. Kingdom of Ashes looks good, but I didn't like A Wicked Thing that much so I'm iffy about grabbing it (but I hope it's good for you!). Also, love the Dorian pin! Have a great week, Alyssa! I didn't love A Wicked Thing either, but I've heard that Kingdom of Ashes is much better! Nice haul! I´m looking forward to read Walk The Edge. Ahh The Winner's Kiss! I hope you loveeee! I'm reading Crime this week (finally!). Also hope Walk the Edge is great. Finally indeed! Although I think it's great that you're practically binge-reading the series - less painful in that way.